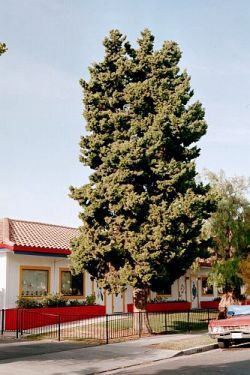 Comments: Evergreen conifer native to the mountains of coastal California from Mendocino to Santa Barbara Counties. Also, a small population within Alameda County. Small scale like dark green leaves held tight to green branchlets. Rough brown red bark on trunk and large branches. Cone is spherical and 1" to 2" in diameter. Generally cylindrical in form with top broadening with age and height.